Click here for more messages from The Sermon on the Mount series. In chapter five we dealt with the Christian’s character, the Christian’s influence, and the Christian’s righteousness. In chapter six we dealt with the Christian’s motivation – “God first!” Now in chapter seven we will deal with the Christian’s relationships in verses 1-12, and then finally the Christian’s destiny in verses 13-27. If Christians were to pick their favorite verse in the Bible, it would probably be John 3:16: “For God so loved the world, he gave his only Son, that whoever believes in him shall not perish but have eternal life.” If the world were to pick its favorite verse, it would probably be this verse right here in Matthew 7:1: “Do not judge.” Not many people know their Bibles, but it seems everyone knows the verse: “Do not judge.” They may not even know where it is found, they couldn’t tell you the chapter and verse, but they still know it and quote it frequently. The problem is they don’t know it in its context. It is not only one of the most frequently quoted verses today, but it is also one of the most misunderstood. 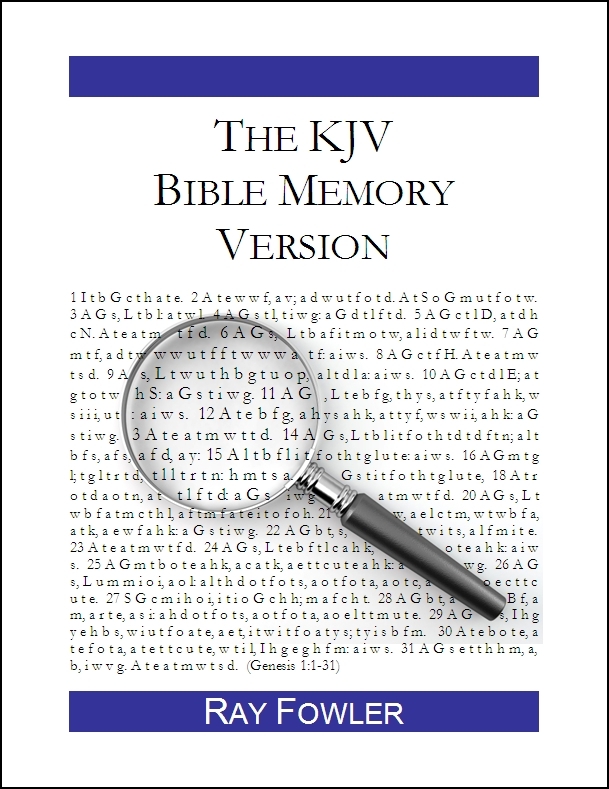 Here’s a picture showing how too many people read their Bibles today. They know the verse, but they don’t know its context. This is a particularly challenging section of the Sermon on the Mount, and it is a section that I find I am struggling with lately. I don’t know, maybe I’m just getting old and cranky, but I find myself having to confess the sin of judging and a critical spirit more and more these days. I pray that God will use this section of Scripture to help both me and you today. A. He does not prohibit making moral judgments. First of all, when Jesus says, “Do not judge,” he does not prohibit making moral judgments, that is, discerning what is right or wrong according to God’s Word. We know this because in other places the Bible actually requires us to make moral judgments. In fact later on in this very same chapter Jesus will tell us to make moral judgments – twice: in verse 6 when he tells us not to cast our pearls before pigs, and then again in verses 15-20 when he tells us to watch out for false prophets. We would not be able to obey either of these commands unless we were allowed to make moral judgments as to what is right and what is wrong. In John 7:24 Jesus says, “Stop judging by mere appearances, and make a right judgment.” (John 7:24) Ephesians 5:11 says, “Have nothing to do with the fruitless deeds of darkness, but rather expose them.” (Ephesians 5:11) As Christians we are required to make moral judgments, correctly discerning what is right and what is wrong according to God’s Word. Ironically, although this is not what Jesus means by this verse, this is the way most people who quote the verse interpret it. They think Jesus is saying you can’t call sin “sin,” that you can’t comment on moral behavior, that you can’t judge someone else’s actions as wrong. The problem is if you can’t judge something to be wrong, then you can’t judge it to be right either. And so the same people who say, “Do not judge” when we make the moral judgment that a certain action is wrong, are also judging when they make the moral judgment that a certain action is right. When Jesus says, “Do not judge” he does not prohibit making moral judgments. We must all make decisions concerning what is right and what is wrong. So what does Jesus forbid here? B. He does forbid a critical, judgmental spirit. What Jesus forbids is a critical, judgmental spirit. He is not talking about evaluating behavior but rather condemning people, looking down on other people. And so Jesus in this verse does not prohibit us from making moral judgments. We must discern right from wrong. We must teach God’s commandments. We must proclaim the truth. But he does forbid you from having a critical, judgmental spirit that exalts yourself while looking down on others. That’s the problem Jesus tackles here, and it’s a big problem that we all must address. So we now know what Jesus means when he says, “Do not judge.” He is forbidding a critical, judgmental spirit that looks down on other people. Next, Jesus goes on to tell us why you shouldn’t judge others. And he gives us four reasons in these verses. The first reason is a real simple one. You’re not the judge. Look at verse one again: “Do not judge, or you too will be judged.” (Matthew 7:1) Guess what, if you are going to be judged yourself, then that means you are not the judge. Little hint here: if you’re in the courtroom, and someone else is sitting at the bench and holding the gavel, and it’s your life that is being evaluated, then don’t fool yourself – you’re not the judge. You’re not the judge; God is. Unfortunately, some people like to set themselves up as judge, jury and executioner. They have a harsh, critical spirit. They are always looking at other people’s faults. They like to play the role of judge. But there’s a reason God is the judge and you’re not. You’re not qualified. You don’t know the other person’s history or background. You don’t know the extenuating circumstances. You don’t know how far they’ve come. Most of all you don’t know the other person’s motives. You can see their actions, but you can’t see their heart. Paul writes in Romans 14: “Who are you to judge someone else’s servant? To his own master he stands or falls.” (Romans 14:4) What is Paul saying here? You’re not the judge! You are not qualified to be the judge. Only God can judge perfectly. We read in James 4: “Anyone who speaks against his brother or judges him speaks against the law and judges it. When you judge the law, you are not keeping it, but sitting in judgment on it. There is only one Lawgiver and Judge, the one who is able to save and destroy. But you—who are you to judge your neighbor?” (James 4:11-12) James says there is only one Lawgiver and Judge, and it’s not you! James says when you speak against your brother you are not only judging your brother, you are also judging the law. Do you know why that is? It’s because the law tells you to love your neighbor as yourself, and when you speak against your neighbor, you are no longer loving them but judging them. When you set yourself up as judge, you make yourself out to be better than other people, and there’s two problems with that. First of all, you’re not, and secondly you are failing to love your neighbor as yourself. You cannot love and judge at the same time. Why shouldn’t you judge others? The first reason Jesus gives us is because you’re not the judge. God will judge you the same way you judge others. Are you harsh and overbearing toward others? Then God will judge you harshly. Are you loving and merciful toward others? Do you have a generous spirit, overlooking the faults of others? Then God will show you mercy. God will treat you as you have treated others. We find this same principle in other parts of Scripture as well. Paul writes in Romans 2:1: “You, therefore, have no excuse, you who pass judgment on someone else, for at whatever point you judge the other, you are condemning yourself, because you who pass judgment do the same things” (Romans 2:1) In other words Jesus says you may expect to receive judgment on the same basis as you give it. The Rabbis spoke of two measures God used in judging people – the measure of justice and the measure of mercy. Which measure do you use with other people? Which measure do you want God to use with you? There’s a Bruce Cockburn song that goes like this: “Everybody loves to see justice done … on somebody else.” But we don’t like that same measure used on ourselves. We read in James 2: “Speak and act as those who are going to be judged by the law that gives freedom, because judgment without mercy will be shown to anyone who has not been merciful. Mercy triumphs over judgment!” (James 2:12-13) Once again God urges us to be merciful to others rather than have a harsh or critical spirit. This is the second reason Jesus gives why you shouldn’t judge. Because God will judge you the same way you judge others. This is a marvelous illustration full of humor and wisdom that cuts right to the point. The emphasis in these verses is on those two little words “your own.” Three times in three verses Jesus speaks about “your own eye.” We are very good at judging others but not so good at judging ourselves. It’s been said that we are good judges for the mistakes of others, but good defense lawyers for our own mistakes. If you are quick to find fault in others, Jesus asks you: “Are you just as quick to find fault in yourself? Do you realize that your very quickness to find fault in others is in itself a great fault?” The third reason why you shouldn’t judge others is you should judge yourself first. The “plank” in this verse refers to a large piece of wood. The same word was used of the main beam in a house or a large sailing mast or even a battering ram. The battering ram is a telling image, because the person who judges others often uses the truth as a battering ram rather than as a means to gently lead someone to Christ. So this plank in your eye is not just a two by four, but rather a large beam maybe several feet wide and forty feet long. This is another example of Jesus’ use of humor. It’s a crazy image, and a crazy scenario. I’m sure he played it up for laughs as he taught the people. Jesus says you’ve got this huge beam coming out of your own eye, and you’re looking at the speck in your brother’s eye? Are you nuts? And the reason Jesus pictures your sins as the plank, and your brother’s sins as a speck is because you know your sins so much better than theirs. Whatever sin you may see in someone else, you know your own sins so much better. You only know what you see of your brother, but you know your own long history, your own sinful words and actions, your own sinful thoughts. Your sins are a plank to you, but your brother or sister’s sins are only a speck. When you ignore your own sins and you concentrate on the sins of others, you will develop the harsh, critical, judgmental spirit that Jesus forbids in this passage. But when you are truly conscious of your own sins before God, you will grow to be far more generous and loving towards other people and their sins. We have a natural tendency to magnify the faults of others and to minimize our own faults. 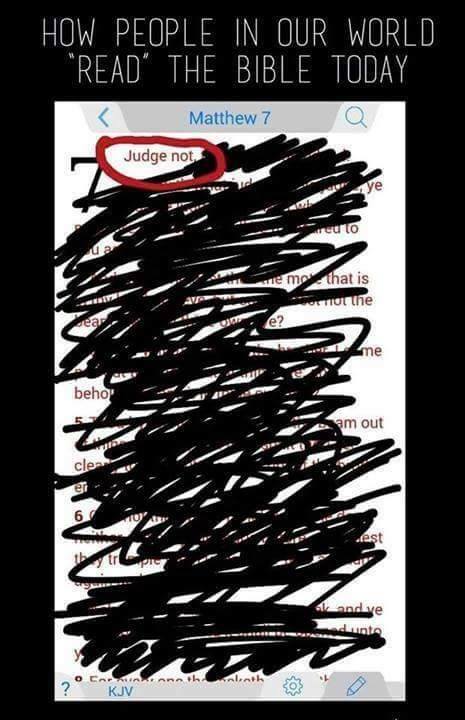 Jesus says you should judge yourself first. Why? First of all, because you know your own sins better than anyone else’s. The second reason Jesus gives is this. Why should you judge yourself first? Because it’s hypocritical to care about others’ sins more than your own. Look at verse 4: “How can you say to your brother, ‘Let me take the speck out of your eye,’ when all the time there is a plank in your own eye? You hypocrite!” (Matthew 7:4) It’s hypocritical to care about others’ sins more than your own. It is hypocritical to place yourself in the role of judge when you have sin of your own. We need to ask ourselves: “Am I equally concerned about all sin against God – including my own?” If you are truly concerned about God and his glory, then you will be more concerned about your own sins than anyone else’s. It is hypocritical to care about others’ sins more than your own. How can you possibly help your brother with the speck in his eye when you’ve got a plank in your own eye? You’ve got this huge beam, forty-feet long, popping out of your eye, and you’re walking up to your brother or sister and saying, “Here let me help you with that.” It’s a ridiculous idea. It’s impossible. Jesus says you’ve got to take care of your own sins first. It’s like when you’re on an airplane, you’ve got to secure your own oxygen first before you can help someone else’s with theirs. Now this doesn’t mean you need to be perfect before you can help others, otherwise no one could ever help anyone. But it does mean you need to confront and confess your own sin to God before you are in a position to help others with their sin. Why shouldn’t you judge others? The third reason is Jesus says you should judge yourself first. If we truly love our brother, we will want to help him with his sin. But Jesus says we must approach him as a brother or sister rather than as a judge. August Van Ryn writes: “Be a helper of the other’s faith, instead of a critic of his faults.” Or as Dietrich Bonhoeffer writes: “Judging others makes us blind, whereas love is illuminating.” You need to get rid of the plank in your own eye so you can see clearly to help your brother. Once again the world will have nothing of this. You try to help someone with their sin and they come back at you with: “Do not judge.” We will address this issue of the person who does not want to be helped in just a moment when we get to verse 6. But right now I want you to understand that when Jesus says “Do not judge,” he does not forbid helping each other when we sin; rather he forbids a harsh, critical spirit that gets in the way of helping each other. The Scriptures teach us the importance of gentleness when helping someone with their sin. We read in Galatians 6:1: “Brothers, if someone is caught in a sin, you who are spiritual should restore him gently. But watch yourself, or you also may be tempted.” (Galatians 6:1) How do you remove a speck from someone’s eye? Carefully! Gently! And in a spirit of love. 1 Peter 4:8 says: “Love covers over a multitude of sins.” (1 Peter 4:8) I like what Billy Graham said: “It’s the Holy Spirit’s job to convict, God’s job to judge, and my job to love.” That’s the fourth reason why you shouldn’t judge others. God calls you to help others rather than judge them. Not everyone will take it kindly when you try to help them with their sin. So what about those who refuse to be helped? Let me share with you three things from verse 6 that will help you with that. A. You cannot force the gospel on people. First of all, Jesus teaches us in this verse that you cannot force the gospel on people. You might remember the famous line from the movie A Few Good Men – “You can’t handle the truth!” Well, sadly there are people who can’t seem to handle the truth of the gospel. We know how precious the gospel is and we want everyone to know God’s amazing love and forgiveness that he offers us through Jesus Christ. But you can only offer the gospel to people. You can’t force it. B. Do not engage those who treat the gospel with contempt. Secondly, Jesus teaches us this: Do not engage those who treat the gospel with contempt. Jesus’ words in verse 6 startle us at first, and they should! Why does he call some people dogs and pigs? Well, dogs and pigs were both considered unclean animals in those days. By the way, these were wild dogs Jesus was talking about, not pet dogs like we have today. Of course, some people have pet pigs today, too! Jesus says you wouldn’t give sacred meat to wild dogs. They wouldn’t know the difference anyways. And pigs are not going to be happy if you feed them pearls instead of pods. They will just trample them under their feet, and then they may turn on you, too. It’s like here in Florida we have a rule, don’t feed the alligators. Why? Because they will come after you if you do. Don’t engage those who treat the gospel with contempt. Proverbs 23:9 says: “Do not speak to a fool, for he will scorn the wisdom of your words.” (Proverbs 23:9) Proverbs 9:8 says: “Do not rebuke a mocker or he will hate you; rebuke a wise man and he will love you.” (Proverbs 9:8) So here is an example, as we said in verse one, where we must exercise discernment and make right judgments. Jesus told his disciples the same thing when he sent them out on mission. He told them: “If anyone will not welcome you or listen to your words, shake the dust off your feet when you leave that home or town.” (Matthew 10:14) When someone continuously rejects the gospel, it’s time to move on. You can continue to pray for them, and if you have a relationship with them, you can continue to be their friend. But don’t continually engage them with the gospel. Jesus says do not offer the things of God to people who show contempt for the things of God. Love them, pray for them, live out your Christian witness before them, but don’t engage those who treat the gospel with contempt. C. Understand the supreme value of following Jesus and God’s Word. And then finally, understand the supreme value of following Jesus and God’s Word. There’s a reason Jesus used the images of sacred things and pearls in this verse, and that is because there is nothing more valuable than following Jesus and God’s Word. We read in Matthew 13: “The kingdom of heaven is like a merchant looking for fine pearls. When he found one of great value, he went away and sold everything he had and bought it.” (Matthew 13:45-46) Psalm 19 says this about God’s commands in his word: “They are more precious than gold, than much pure gold.” (Psalm 19:10) There is nothing more valuable than following Jesus and God’s Word. CONCLUSION: So how are you doing in this area? How is your spirit towards other people and their faults? Are you loving people or judging people? As I said earlier, this is an area of sin that I have been confessing a lot lately, and I am praying that God will help me do better. How do we approach our relationships with other people? We are to practice discernment and make right moral judgments, but we must always speak the truth in love. We are to approach each other as brothers and sisters who love rather than as judges who judge.